As the nights begin to cool, the sky gets darker every morning. I can feel summer starting to slip away. The fact of the matter is that I am not quite ready to let summer go, but I don’t have much control over it. As a result I am frantically trying to squeeze in as many outdoor adventures as I can. Last weekend I managed to attend three different festivals in two days! The Canadian National Exhibition After a relatively relaxing Friday night at the Horseshoe Tavern, Tyron and I work up bright and early to be the first people in line at The Ex. I have been to The Ex a handful of times over the past few years, and was eager to show Tyron, a first timer, what the Toronto tradition was all about. As usual, my favourite exhibit was the Super Dog show. Even though I know the routine like the back of my hand, I still get giddy watching the dogs jump, dance and relay race each other (somehow the teams tie every year). Tyron, who was at first skeptical of a dog show, was rather impressed with the canine talent. Toronto Underground Market I had never heard of TUM before my girlfriend Megan invited me to go with her. We bought tickets in advanced online for $10, and as we overheard from another attendee, the tickets always sell out. We took the subway to Broadview station, where a yellow school bus was waiting to shuttle everyone to the Evergreen Brick Works. We arrived just after 6pm when it opened and there was already quite a line up. As we queued, delicious smells of seafood, BBQ meat and pungent spices wafted by us. The line was quick and we were soon inside the beautiful open roof building. Inside there were a number of food stations set up by local entrepreneurial cooks ready to show off their talent. Each stall offered a few select options, that you could purchase in a sample size. Most of the dishes cost about $5 give or take depending on the complexity and ingredients. 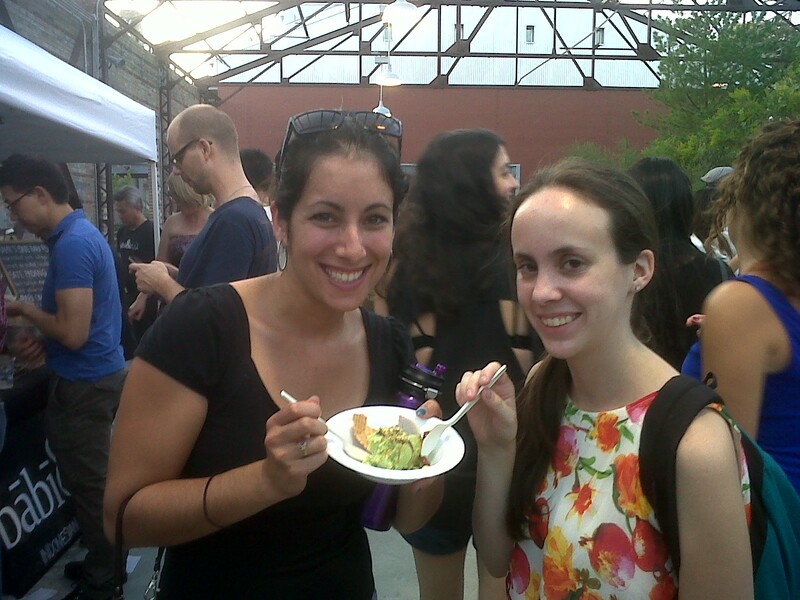 We discovered that it is best to attend the event with a group of friends so you can share and try a bit of everything. I had a pork belly slider in a pineapple bun, oysters with three different kinds of sauces, mini tacos, cornbread grilled cheese, avocado and goat cheese ice-cream and a home made watermelon-lemon-mint popsicle. Everything I had was delicious and there was plenty of beer to wash it all down with. TUM was the highlight of my weekend, and I can’t wait to go to the next one. Busker Fest I finished off the weekend with a visit from my Mom. 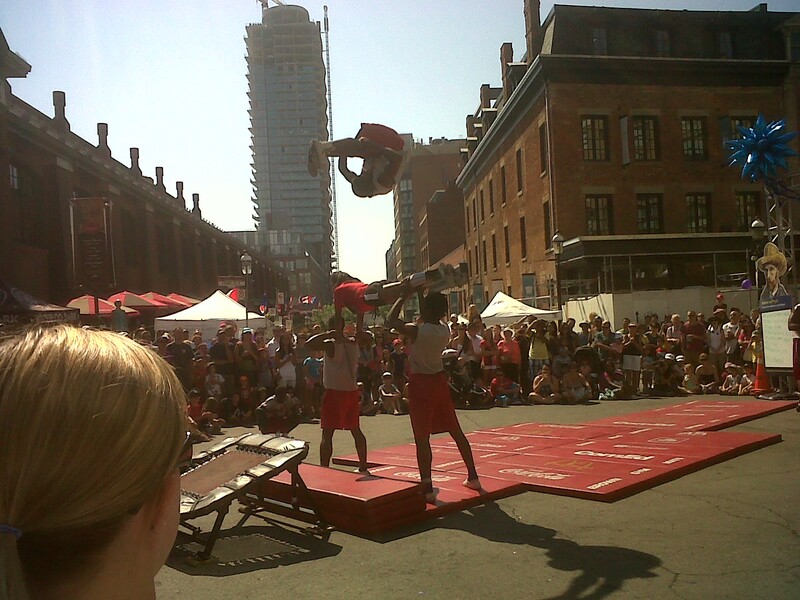 We walked to the St. Lawrence market where the streets were lined with street performers and food stalls. We saw an ensemble who were doing tradition ‘pride and prejudice’ style dancing to classical music and some tumblers from Chicago who would jump over their friends in a single bound. 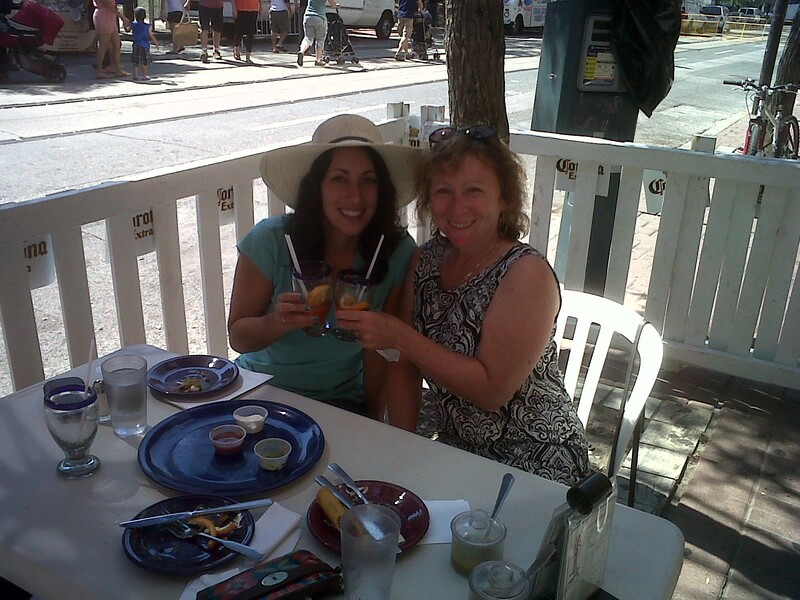 There was a lot else going on, but it was a hot day, and a nearby mexican restaurant had two glasses of sangria waiting with our names on them. At the end of the weekend I felt like I had made the most of my two short days off work, and was ready to face another monday. That was a lot of fun! Nice surprise to have Tyron join us for some lunch!